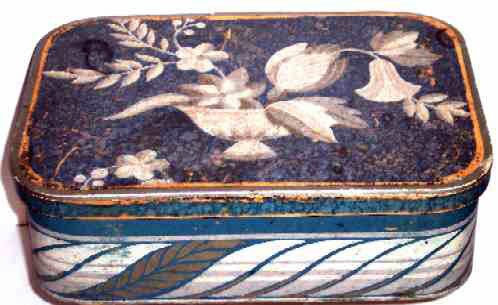 This is one of the nicest wallpaper covered boxes we have had the pleasure to present. The condition is outstanding with only minor wear to the paper, mostly on the edges. This color on this box was really hard to photograph and is much softer than shows in the pictures. 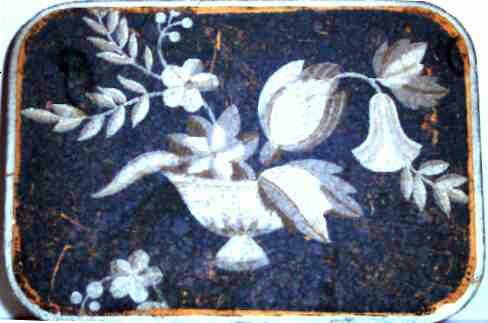 The Theorem picture painted on the lid is done in white and gray is appears much like a grisaille painting. The rectangular box is 10" long x 7" wide x 3" high and is the perfect size to hold one's little keepsakes and treasures. All that beauty is to come. Like the fall of blighted leaves.